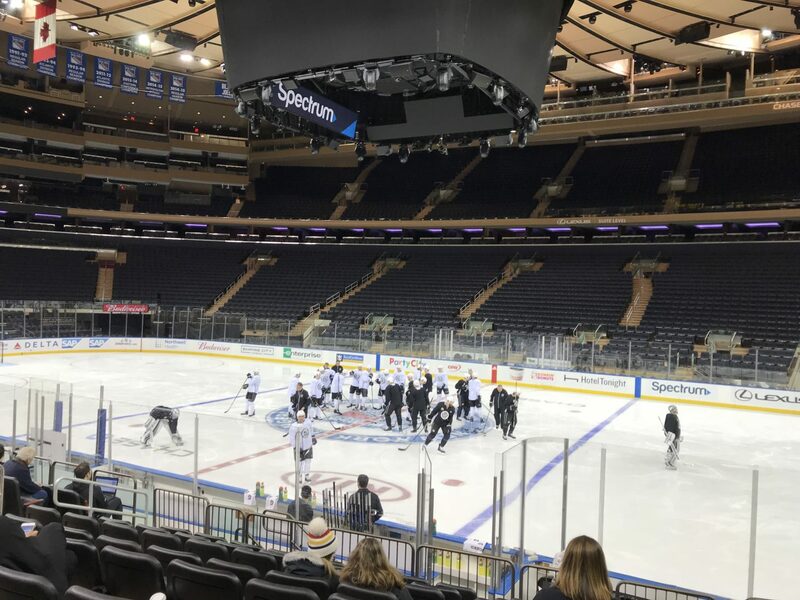 -Jonathan Quick left the ice first at the morning skate, and technically the #LAKingsGoalieTweetOff applies because this is the first night of a back-to-back, but did you not expect Quick to start at Madison Square Garden? Tonight should mark his first game at the Garden since late in the 2014-15 season, when he stopped 34-of-36 shots in Los Angeles’ 4-2 Cup Final rematch against New York on March 24, 2015. Peter Budaj made his lone 2015-16 appearance in an overtime win the following year, and Jeff Zatkoff drew the start last season. Quick is 4-3-0 with a 2.43 goals-against average and a .907 save percentage against the Rangers in his career, but those numbers don’t take into account what he meant to the team in the first period in Game 3 of the 2014 Stanley Cup Final. This is a building he enjoys playing in. -Based on line rushes, extras are expected to be Andy Andreoff, Jonny Brodzinski and Oscar Fantenberg. That means we’re likely to see the reunion of the Clifford-Shore-Lewis line that had been a constant nuisance to opposing teams during the preseason and the first two and a half games of the regular season prior to Kyle Clifford’s upper-body injury. Of course, there is the advice to Try Not To Get Attached To Lines because they’re rarely static (with the exception coming when all three players’ numbers are in the 70’s and they’re keeping the puck on a string and away from the Chicago Blackhawks in a Western Conference Finals playoff series). -Tonight’s game follows a five-day stretch in which Los Angeles played one game and practiced two times. That gave the team a needed break after a breakneck pace of games, the last eight of which they won, prior to the New Jersey game. They also traveled to the East Coast twice over the compacted stretch. With one game in five days, was there anything in particular that the coaching staff focused on? Tonight’s game will serve as the ultimate judge, but the recently relaxed schedule did allow the team the necessary breather, which, as Dustin Brown noted, was more about refilling the emotional reservoir than it was about resting any sore bones some 30-plus games in. The team held an off-ice workout instead of a practice on Thursday, which was taken advantage of by the players. There were no buses to the rink, no skates to change into. It sounds silly, because these are well compensated athletes playing a game they love, but over 82 games played in six months plus one week, these rest periods are so necessary. With that in mind, is it possible for a morning skate in advance of a game to replicate the types of systems-instilling practices that are more prevalent early in the season? Stevens worked as an assistant under both Darryl Sutter and Terry Murray – and credited both, along with Dean Lombardi, when asked about his evolution in coaching earlier this morning. But as a player who has played through six different coaches (Andy Murray, John Torchetti, Marc Crawford, Terry Murray, Darryl Sutter and John Stevens), Brown was asked whether there’s any noticeable difference between the way Sutter and Stevens schedule balance their practices with rest. It should make for a very interesting match-up tonight. The Kings traditionally produced good efforts at Madison Square Garden under Sutter, going 3-1-0 in the regular season and 1-1 in the playoffs, with strong performances marking both losses. -Officials for tonight’s game are referees Brian Pochmara and Gord Dwyer, and linesmen Darren Gibbs and Matt MacPherson. I’ll be joined by Assistant Coach Dave Lowry (and, barring a potential switch or two, Gaborik) during tonight’s LA Kings Live pre-game show, which begins at 3:30 p.m. PT.